Junumani Pathak, aged 33, lives in a village in the northeast of India. Already at a young age she dreamed of getting a good education and a respected job. Fortunately, her supportive parents let her finish school up to 10th class. Today, her job makes sure her family has stable income. Her two children can go to school and Junumani feels strong and empowered. Junumani works at Women on Wings’ partner Tamul Plates Marketing Pvt Ltd (Tamul Plates). On a regular base, teams from Women on Wings travel to Barpeta, Assam, to work with Tamul Plates on its growth strategy. 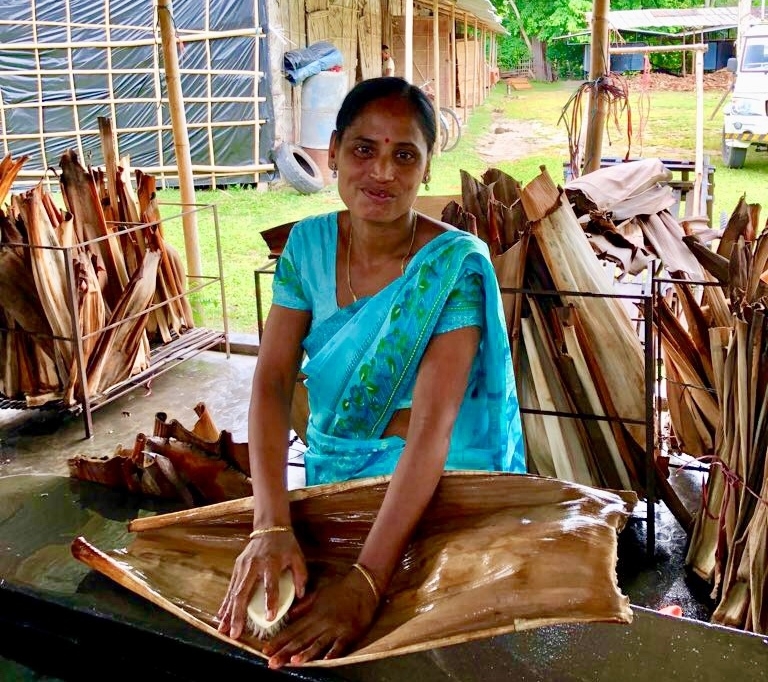 Recently Women on Wings’ expert Antoine Miltenburg and sr business consultant Shashank Teotia worked on improving Tamul Plates’ sales processes, during which they met Junumani who was happy to share her life’s story. At the age of 22 Junumani got married. Her husband did not have regular income so life did not change much as there was hardship and financial instability at her parental house as well as at her in-laws’. Soon after marriage she gave birth to a son, now 10. When her son was 3, she heard that Tamul Plates was hiring local women for its natural plates manufacturing unit which was near her home. She decided it was the perfect job for her as she could combine it very well with her household chores. Six years after her son was born, Junumani was blessed with a daughter, now 4. “I am really happy with my work. I will make sure to get higher education for both my children, so they can lead better lives. And I will save money to have a huge celebration for my daughter at Tuluni Biya (a local ceremony celebrating a girl’s maturity at her first menstrual cycle, red. ),” says Junumani happily.